1. Heat the pan on medium and add sugar and ¾ cup of water. Cook it till sugar is dissolved and syrup comes into boiling point. Keep aside syrup. 2. Take dough and divide into 8-10 equal balls. Take each ball and use your finger to spread little. 3. Mix ¾ mawa and nutmeg powder and place spoonful of mawa mix on the spread dough. 4. Close the dough and make it flat. Press little bit in the middle. 5. Heat the oil on low heat and fry the stuffed flat bread till it becomes golden. Remove it from oil and soak it about 3-5 minutes into syrup. 6. 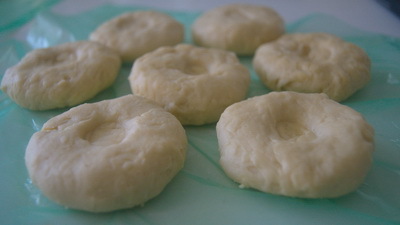 Take out from syrup and roll it in mawa. Repeat the process with rest of balls. 7. Balushahi is ready to serve. 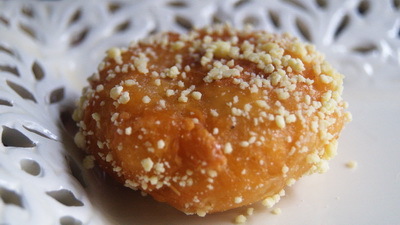 Tips: Balushahi dough will be crumble one. You can check in the picture. many thanks for representing us. Congratulations on your great job. take care. We (Bangladeshi) are very passionate about food. Its my honour getting chance to show the world. what is the meaning of “300 short crust pastry dough”. i want to know abt short crust pastry dough…. I am live in USA. I went to two big grocery stores here. They don’t have such thing call “short crust pastry dough”. Is this call pastry sheet or apple pie dough? Where do I get it? If you make at home, can I have your recipe please. Thank you. buy short crust pastry sheet. apple pie dough will do too. I will post soon Balushahi from scratch. Thanks. plz can u show or explain how to give the balushai shape from a square puff pastry/short crust pastry sheet? and aslo how many balusai can be make from one puff pastry sheet? apu pastry dough to bd te paoa jae na…eta sara bananor ki kono method ache with maida …plzz tell me..thank u.
Api I will post Balushahi recipe from scratch. Please keep on eyes. Thanks. Can I use puff pastry sheet from woolworths? Plz tell me how can I make the dough from a sheet…thanks. Yeah certainly you can. Just buy short crust one. Thanks.